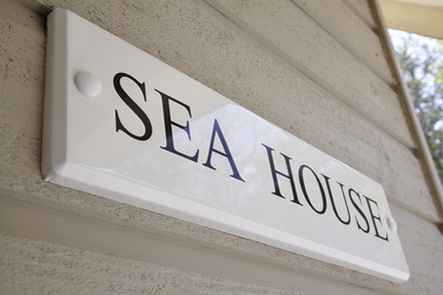 The Sea House is a contemporary four bedroom 2009 rebuild of a Victorian seaside house purchased in 1974. It stands on the same tried and tested footprint as the old house, but incorporates many eco-friendly features. It is situated near the southern end of Pier Road, a rough un-adopted private road belonging to the Earl of Kinnoull. The garden runs right down to the foreshore and there is direct access to the beach. This Access Statement, which we are required to provide, should be read in conjunction with our website to obtain full details of the property. If you have any queries, please call. We look forward to welcoming you. 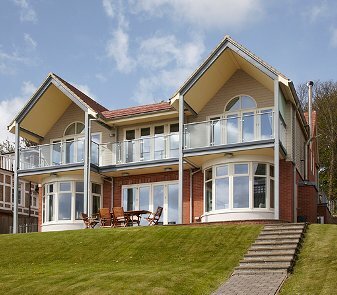 We have a website www.seaviewseahouse.co.uk where details of the property and its location can be found. Bookings/enquiries can be made via email or telephone. Please contact our Property Manager, Sally Richards, at sally@seaviewseahouse.co.uk or 01983 855163. The nearest bus stop is in Seaview village which is approximately a ten minute walk away. The walk, however, is not suitable for carrying holiday luggage. The nearest train station is in Ryde, about 4 miles away, which links with the Wightlink ferry service direct to Portsmouth Harbour Station. A taxi would be needed between Ryde and The Sea House. Private car parking for 3+ cars directly in front of the house. Bollards are in use when car parking spaces are empty. There is a gentle rise up to the front door steps which is more pronounced at its northern end. Luggage can be unloaded at the front of The Sea House. Please see the floor plan attached for details of front entrance as access is gained to the first floor. The front entrance has five steps - 15cm high, 34cm deep, 392cm wide. Top step 98cm deep. There is a covered porch and there is ample lighting which can be switched on both internally and externally. The front entrance door is 82cm wide. There is a low weather bar across the length of the threshold of the front entrance door. The entrance leads directly into the spacious Hall from which there are doors to the Study, 4 Bedrooms and Family Bathroom. Staircase down to the Lounge, Kitchen, Dining areas, Cloakroom, and Utility Room. There is an entrance for the disabled down a ramp to the side of the house on the ground floor. Please note that there are no facilities for the disabled between the ground and first floors. The ramp is a long slope with two sets of steps, each 1m wide, 103cm deep with 11 cm rise. The first set has seven steps; the second two. A level path leads from the bottom of the ramp to the side door where there is a short entrance ramp. The side entrance door is 82cm wide. There is a low weather bar across the length of the threshold of the side entrance door. The side entrance leads to the ground floor Lobby and a large open plan Lounge, Kitchen, Dining and Family areas, Cloakroom and Utility Room. Both ground and first floors are level throughout. There is a ground floor Cloakroom which is accessed from the downstairs Lobby. There are no support rails. The Family Bathroom is on the first floor which is accessed from the Hall. Doors to Bedrooms and Family Bathroom 82cm wide. Doors to En-suite Bathrooms 72cm wide. Doors to Kitchen Area, Utility Room and Cloakroom 79cm. Double doors leading onto the first floor balcony are 138cm wide. There is a low weather bar across threshold. Double doors leading onto ground floor garden terrace are 138cm wide. There is a low weather bar across threshold of 1.5cm up (from inside) and 2cm down to terrace outside. Double doors leading from the Hall to the Study are 142cm wide. Double doors from ground floor Lobby to Family area are 150cm wide. All the Bedrooms and the staircase are covered in short pile carpet; Family Bathroom and En-suites ceramic tiles; all other areas oak laminate. There is a single staircase between the ground and first floor consisting of 17 steps, 6 of which are angled. There are banisters and handrails on both sides. The straight steps are 1m wide, 70cm deep and have a rise of 90cm. Consists of a bath with shower (58cm step), wash basin and WC (40cm high, 28cm space on one side and 137cm on other). Consists of wash basin, shower cubicle (28cm step up) and WC (40cm high, 36cm space on one side and 25cm on other). Consists of wash basin, shower cubicle (28cm step up) and WC (40cm high, 25cm space on one side and 29-32cm on other). Located off of the Hall on the first floor. Bath 58cm step, separate shower cubicle (28cm step up), wash basin and WC (40cm high, 21-25cm space on one side and 40cm on other). Located on ground floor. Consists of hand basin and WC (44cm high, 54cm space on one side and 54cm on other). The ground floor is mostly open plan giving a large area of approximately 11m by 6.5m. The Lounge, Family and Kitchen/Dining areas are divided by archways. The space between these archways is 195cm. Access is via a set of double doors from the downstairs Lobby area or via the door into the Kitchen area from the side entrance corridor. All furniture is moveable except for feature glass topped dolphin table and large L-shaped sofa. Consists of large L-shaped sofa, one circular chair, two barrel chairs, two relax frame chairs, three bean bags. Fitted oak bench inside large bay window 51cm high and fitted bench seats between arches. Opening windows each side of bay window, top windows operated by electric motor. Colour TV with Sky+, DVD and Video. Combi Pool, Table Tennis and Dart Board 102cm wide, 183cm in length and 80cm high. Double glass doors opening out onto garden terrace. Gas-fired Aga has two side opening doors, hot plates 97cm high. Separate alternative cooking unit with four gas hobs and under work surface electric oven, hood over. Small central round work table 75cm in diameter, 90cm high with four stool seats 50cm high. Evenly lit with spotlights above, and lighting under wall units. Wall and floor mounted cupboards. Working surface between kitchen and dining areas. Large oval dining table, part situated in bay window, 244cm long, 166cm wide and 62cm under clearance, supported by four evenly placed legs. Fitted oak bench seat in bay window 51cm high providing seating for one end of table and five dining chairs 46cm high providing seating for other half. Accessed from Kitchen area across side entrance corridor. Sink with hot & cold taps, working surface and cupboards. Overhead drying rack on pulleys. Situated at the foot of the stairs. Double glass doors opening up into Lounge/Kitchen/Dining/Family open plan area. Archway to side entrance corridor and side door. Entrance through double doors from main Hall. Double glass door entrance onto balcony. Two seater cane sofa and two cane armchairs. Wine cooler of 25 bottle capacity. There are four double Bedrooms. Three are En-suite, one with bath and two with showers. Three Bedrooms have twin beds which can be joined together and make up as a double. Sheets, duvet covers and pillow cases are either 100% cotton or poly-cotton. TV points provided in each bedroom. Twin 3ft beds which are joined together to make one 6ft bed. Distance between bed and wall approximately 90cm. Large space between bed and door and right side. Front of bed to wall 160cm. Two chest of drawers and a vanity unit with stool. En-suite bathroom with bath, hand shower, and overhead shower with folding Perspex curtain. Toilet and wash basin with simulated wood topped vanity unit. Large mirror and towel rails (electric and hot water). Colour TV with Sky feed. Double glass doors onto spacious sea-facing balcony. Lovely seascape and beach views from bed. Twin 3ft beds which are joined together to make one 6ft double bed. Distance left hand side of bed to wall approximately 1m. Large free space on right side of bed. Chest of drawers and a vanity unit with stool. Chair bed which opens up to a 3ft bed. En-suite bathroom with shower cubicle, toilet and wash basin. TV point with Sky feed. Double glass doors onto sea-facing balcony. Twin 3ft beds 62cm high. Distance between left side of bed and wall 50cm approximately. Distance between beds approximately 55cm. Beds can be joined together to make up a 6ft bed. 2ft6in bed 61cm high. Left side 20cm from wall and window. 3ft bunk beds with right side against wall. Ground to top mattress 130cm, ground to bottom mattress 50cm. 53cm clearance between beds. Four step built in ladder to top bunk. Large stone-flagged terrace along the width of the house with two steps down to the lawn. Steps are 304cm wide, 50cm deep with a rise of 17cm. Garden is entirely laid to lawn which goes down to the sea wall. It is tiered with steep slopes. On the less steep left side there is a path with steps down to a gate with entrance to the sea wall. Path is 1m wide with three sets of steps of 9, 5 and 2 respectively. Steps are 50cm deep with a rise of 15cm, with the exception of the bottom two steps have a rise of 10cm. Two gates onto the sea wall. A single gate at the bottom of the steps 106cm wide, with a 6ft double gate at the other side of the garden. Chestnut pale fence separating the garden from the sea wall. Concrete slab terrace at the bottom of the garden for boat storage or sitting out. Outside shower on the terrace. There is a small drop from the terrace to the path leading to the ground floor side entrance. The drop is marked with a chalk line. The sea wall some 4m deep is owned in common with three neighbours. From the concrete front of the sea wall there is a vertical drop onto shingle or rocks below between 1.2m and 1.8m, depending upon the beach state. There is a pending application before the Isle of Wight Council to designate the sea wall as a public right of way. Access from the sea wall to the beach is down steps, the number and depth of which can vary with the shingle cover. At high tide the water normally extends up to the sea wall. At spring tides, or in rough weather, the waves can breach over the sea wall and sometimes into the garden. The beach in front of the house is part of the well known and much sought after Seagrove Bay. Its height and state can vary from tide to tide depending upon the sea conditions. It is a mixture of shingle, small rocks and sand. It is generally regarded as ideal and safe for small children. Access to and from the house to the beach might not be suitable for the disabled. In those circumstances, there is a wide public slipway some 150 yards south of the house, accessed from a path extending from Pier Road. The slipway provides good access to the beach in all weathers and tides. There is a small one room self-contained flat at the rear of the house. It is owned by me and leased to my four daughters. It has its own separate independent entrance. The occupants can enjoy access to the sea along the path to the side of the garden. They do not have the use of the garden. They are not permitted to sleep in the flat. A Guest Manual is produced in mainly size 12 font. Light switches and power points are at sensible heights to reach from sitting and standing positions. We welcome your feedback to help us continuously improve. If you have any comments please phone Sally on 01983 855163 or email her at sally@seaviewseahouse.co.uk.